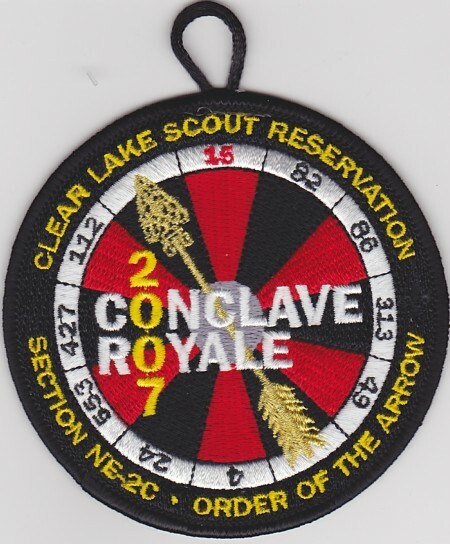 2007 Section NE-2C Conclave – Conclave Royale Staff Pocket Patch? 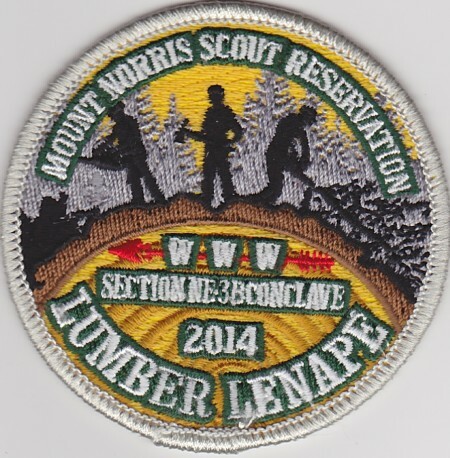 I’d previously written about the 2007 Section NE-2C Conclave was hosted by Ktemaque Lodge #15, which was held at Clear Lake Scout Reservation. I just came across another patch which I believe may be the Staff or a COC issue. Unlike the regular particpant issue, this one has a Gold Mylar arrow. Can anyone confirm its purpose? I’ll update the original post with this picture too. Section NE-2C is composed of 10 lodges. The 5 GNYC Lodges, two NYS Lodges from just north of NYC and 3 CT Lodges. 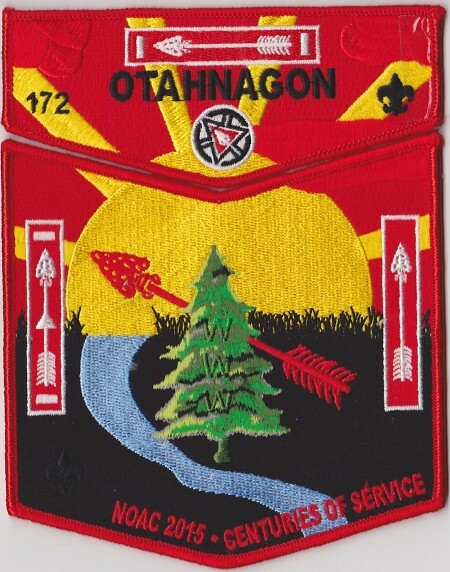 For the 2015 NOAC, Otahnagon Lodge #172 issued 4 different 2-piece sets which shared a common design, but each set has a different border color. I’ll be listing them from the most sets issued to the least issued (at least according to PatchScan. The first set has a Black border. There are reportedly 300 sets. The 37th Annual Northeast TOR, is back for another year, but for the first time (to my knowledge) will be held on a Saturday. This is a solid local TOR, it is one of my regular TOR’s. Hope to see some of you there. 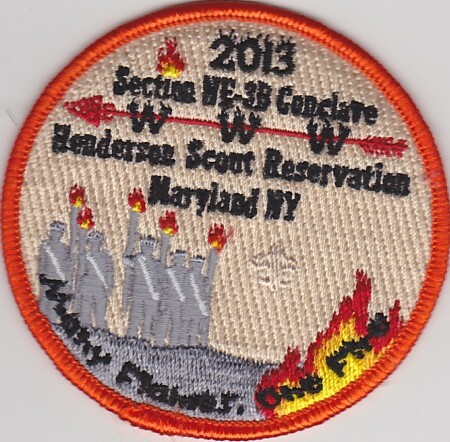 Another update for Section NE-3B, this time for the 2014 Conclave. 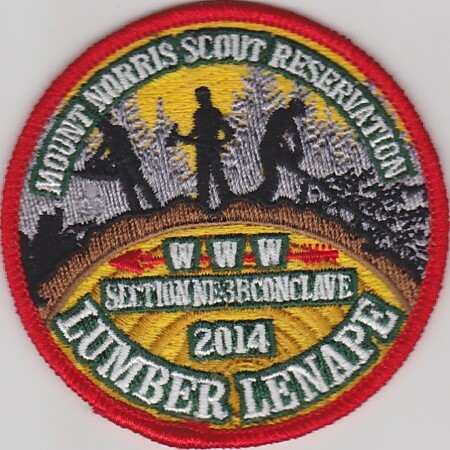 I had previously written about the Section NE-3B 2014 Conclave which was held at Mount Norris Scout Reservation and hosted by Ajapeu Lodge #351. 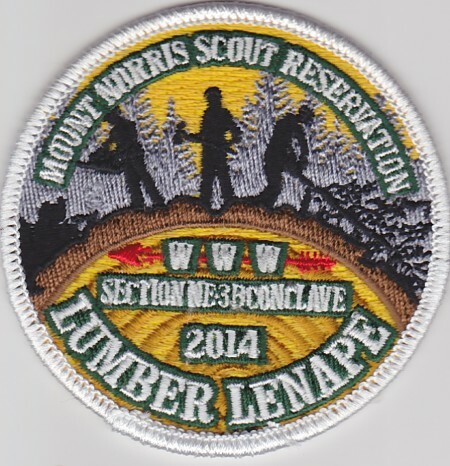 The theme for the weekend was Lumber Lenape. In it I wrote that there were a participation patch, a conclave committee patch and a host lodge patch. I now have images of the three patches, but don’t know which is which. First a red bordered version. Can anyone confirm the purpose of each border color? OK, I’m a bit older than 12, but it was 12 years ago today on January 26, 2004 that the New York OA Trader Blog was born on Blogger, with the following mission statement. Fast approaching 4400 hundred posts have been written since then with thousands of new and newly discovered NYS OA issues being shared with my readers. I’ve added NY OA Conclave issues, NY OA neckerchief slides and belt buckles to my reporting since then. Thanks to all of you who continue to provide information about new and older issues from your lodges through scans, trades, comments and encouragement. I hope to continue this blog for years to come. I had previously written about the Section NE-3B 2013 Conclave. 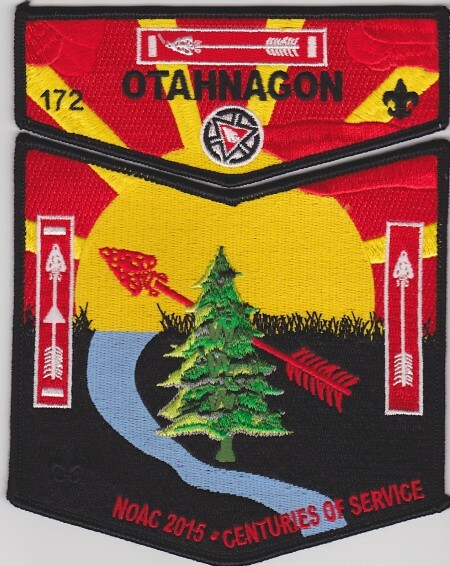 Talking with Mike Shaver last fall, I became aware that there was a fourth pocket patch, this one with an Orange Border. Not sure what the purpose of this issue was. Does anyone else know? I’d be interested in trading or buying for the neckerchief from the event if anyone has one available. Were there any more items issued? I’ll update the original post with this image too.